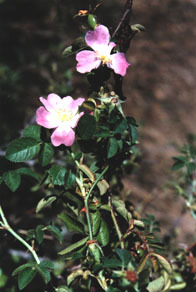 Growth Habit: A many stemmed rose bush whose arching branches can reach 3 metres in height. The branches have many backward curving prickles. In Tasmania the bush usually is leafless in Winter. It has an extensive shallow root system. Type of Plant: A deciduous, upright shrub. Flowers: Pink to white fragrant flowers consisting of a single row of five petals. Fruit/Seed: The rose hip is an oval shaped fruit up to 2 cm long and is usually red to orange in colour when ripe. Each hip contains many small yellow seeds. Dispersal: Historically, Sweet Briar was introduced in to Tasmania by people using it in their paddock hedges and ornamental gardens. Now the main source of new plants are the droppings of animals and birds that have feed on the hips. The seeds may also be washed along drainage lines by water. Seeds remain viable for 3 or 4 years. Distribution: This plant is found throughout all the major agricultural areas of Tasmania. It does best in places where there is little grazing pressure from sheep or goats, along fence lines, in degraded pastures and along roadsides. The Sweet briar does best in well drained, fertile soils. Status: The Sweet Briar is a Declared Noxious Weed in the ACT, Victoria, South Australia ,and parts of NSW. It is a Declared Secondary Weed in Tasmania. Weed Impact: Sweet Briar has a long history in Tasmania and was already widely dispersed throughout the state by 1838. It can create problems in areas where the young seedlings have some protection from grazing pressure. Once it has gained some height its prickly nature deters grazing animals. Land fenced off for revegatation or stream side reserves may become heavily infested preventing access. Dense patches of Sweet Briar in pasture can cause problems for land managers by hindering the mustering of stock and providing refuge areas for rabbits. It appears that this plant has chemical properties that can suppress the growth of other plant species near by. It can over a period of time dominate the native understory plants. Rose hips have been used in herbal medicines for many centuries. Fruit can contain 16 times the amount of Vitamin C as oranges and lemons. It can be processed into jellies, syrups and wines. It has long been used as root stock for ornamental roses. For more information on the Sweet Briar, contact the Department of Primary Industries, Water and Environment (Service Sheet Agdex 647). Physical Removal. Briar rose may be easily removed with tools such as a spade or mattock. Gloves should always be worn due to the prickly thorns on stems. Ensure all main roots are removed, otherwise they may regrow. Grazing. Grazing by livestock such as sheep is unlikely to control mature briar rose plants due to their prickly nature, however seedlings can be controlled through periodic heavy grazing.